Will John Lennon’s "Paperback Writer" Guitar Be a Million-Dollar Seller? There are very few objects relating to the lives and careers of John Lennon, Paul McCartney, George Harrison, and Ringo Starr that are not coveted by Beatles fans. Some collect one-inch squares of the bed sheets the lads allegedly slept between during their 1964 North American tour. Others prefer brightly colored lunch boxes, from the metal containers manufactured in 1965 by Aladdin, featuring portraits and signatures of the Fab Four, to the cartoony, 1968 vintage “Yellow Submarine” lunch boxes produced by a company called King Seeley, in conjunction with the release of the full-length animated feature from that year. Then there are those who must have—and can afford—more arcane items, such as John Lennon’s molar, for which a Canadian dentist paid $31,000 in 2011. As recently as June of 2014, our neighbor to the north’s most famous jawbreaker (it’s a low bar…) was still expressing interest in using the DNA in Lennon’s tooth to clone the late Beatle by means of artificial insemination. This November, a more musical, and arguably just as personal, Lennon artifact is up for grabs courtesy of U.K. auctioneer TracksAuction.com, which is selling the 1963 Gretsch model 6120 Chet Atkins Nashville hollow-body guitar used by Lennon in the spring of 1966 during the recording session for “Paperback Writer,” and perhaps other tunes. Given as a gift by Lennon to his cousin David Birch in 1967, the guitar has been in Birch’s possession ever since, which means there’s not a shred of doubt as to its authenticity and provenance, a rare condition in the untidy world of rock memorabilia. Accordingly, bidding will begin at £400,000 (as of 10/15/14, $638,048) when the online auction opens on November 14, 2014, and could crest $1 million by the time live bidding ends on November 23. 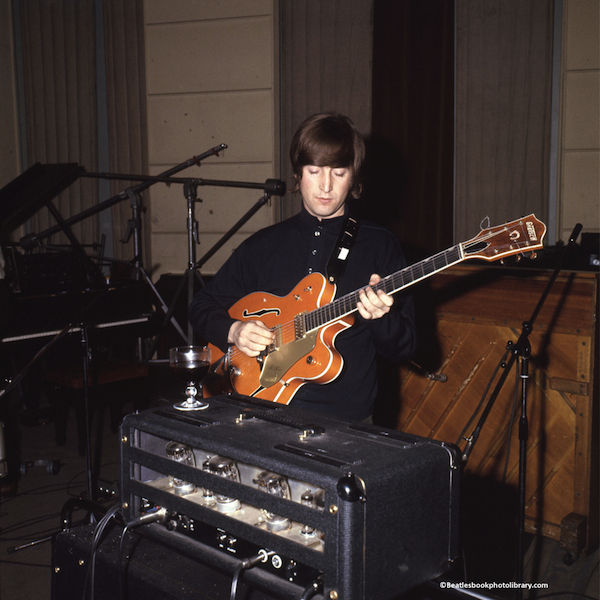 Top: John Lennon playing his Gretsch 6120 on April 14, 1966, at EMI Studio 3 during the “Paperback Writer” session. Photo by “Beatles Monthly Book” photographer Leslie Bryce. 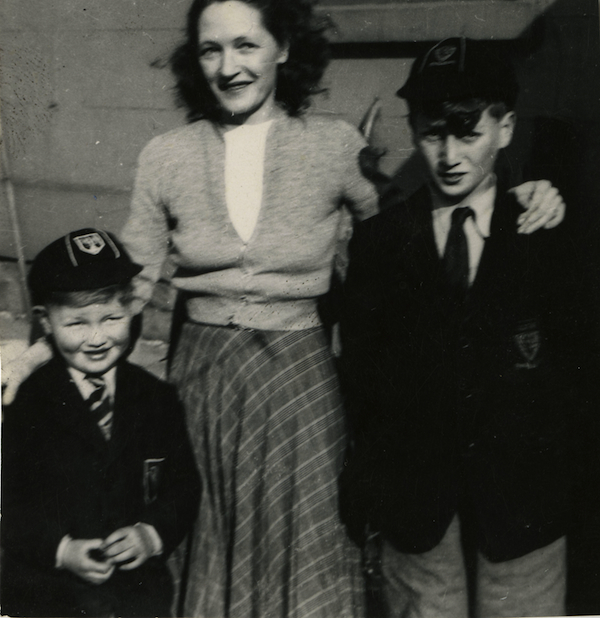 Above: David Birch (left), his mom, Harriet, and John Lennon in 1952. Lennon gave the guitar to his cousin in 1967 when the Beatle was 27, but the story actually begins in July of 1946, when Lennon, then 5 years old, was forced to choose between his father, Alfred, and his mother, Julia, whom Alfred had abandoned after returning home from World War II. Lennon ultimately chose his mother, but because Julia lacked the means to care for the lad properly, he was raised by one of Julia’s four sisters, Mimi Smith, and her husband, George. An only child during his brief years with Julia, and with no siblings to play with in the Smith household where he grew up, Lennon frequently enjoyed the company of his cousins, including young David Birch, eight years his junior, who lived about a mile away. For Birch, Lennon was no doubt the more worldly, older-brother figure he never had. For Lennon, Birch was just a little boy, which is why it would probably be a stretch to say the two were the closest of chums—when Lennon founded the Quarrymen in 1957, he was just 15 and his cousin was all of 7. Still, family ties united them. After Lennon’s mother, Julia, was killed in 1958 (she was struck by a car), his younger half-sisters, Julia Baird and Jacqui Dykins, moved in with Birch’s family, giving Lennon and Birch one more point of commonality. Soon after that tragedy, The Beatles began to jell, which meant months-long residencies for Lennon in Hamburg, Germany, widening the distance between the cousins. But perhaps because of his rocky upbringing, Lennon remained close to his extended family, especially Mimi, whom he called weekly, even at the height of Beatlemania in the early 1960s. 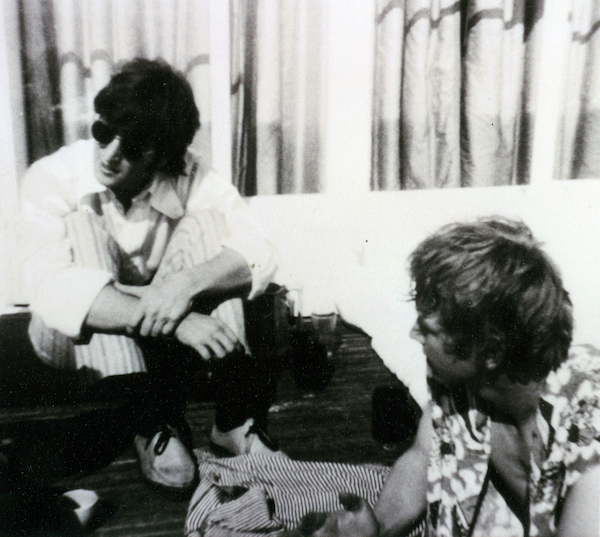 Cousins John Lennon and David Birch at their aunt Mimi’s house in 1966. Birch watched his cousin’s rise from both up close and afar, visiting Lennon’s home, Kenwood, in Weybridge, just southwest of London, on several occasions. By the time the 19-year-old Birch went to stay with Lennon for a couple of days in November of 1967, he, too, was living with Mimi, as Lennon had done before him. Thus the two men were linked by shared experiences, as well as blood. On that November visit, while hanging out in Lennon’s music room, where Lennon wrote such compositions as “We Can Work It Out,” “I Am The Walrus,” “A Day In The Life,” and “Across The Universe,” Birch mentioned that he was trying to start a band. “I was just cheeky enough to ask John for one of his spare guitars,” Birch recalls. “I had my eye on a blue Fender Stratocaster that was lying in the studio, but John suggested and gave me the Gretsch while we were talking.” Over the years, the guitar got enough use by Birch that it underwent a few minor repairs, but the handsome instrument, whose laminated-maple body, headstock, and neck retains its original orange-stain finish, is mostly as it was when it changed hands that day in Lennon’s Kenwood music room. 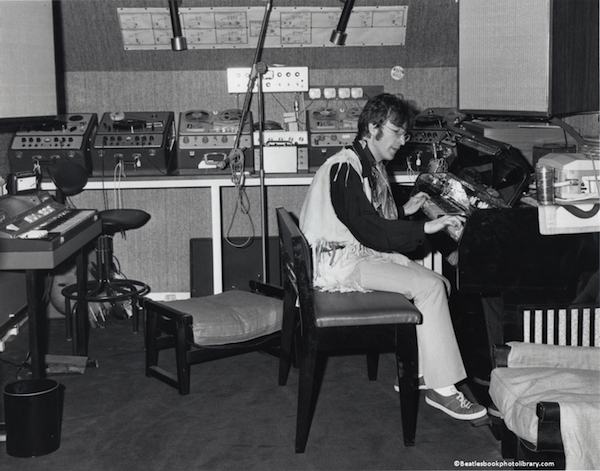 John Lennon in his Kenwood music room—where he gave Birch his Gretsch—in the summer of 1967. Although it is not certain exactly how many Beatles songs were recorded on that particular Gretsch, one session at EMI Studio 3 on Abbey Road has been verified, the one for “Paperback Writer.” The band had not been in the studio for about four months, their last effort being “Rubber Soul,” which featured both folk and Indian influences, as heard in the sitar played by George Harrison on “Norwegian Wood.” That album had been recorded after the band’s second North American tour in 1965—now, in the spring of 1966, a third tour was facing them, and by many accounts, the boys were not particularly looking forward to it. So, in April of 1966, it was into the studio once more, this time to record what would become “Revolver,” which is often ranked as not just one of The Beatles’s best albums, but one of the best rock albums by any band ever. The first song recorded for that album was “Tomorrow Never Knows,” as strong a signal as one could imagine that The Beatles no longer wanted to hold their fans hands as much as drop acid or meditate with them, or so the opening lines would indicate—“Turn off your mind, relax and float downstream,” Lennon sang. Today, musicians such as Phil Lesh of the Grateful Dead will tell you they can remember exactly where they were when they first heard that song. Rock music would never be the same. 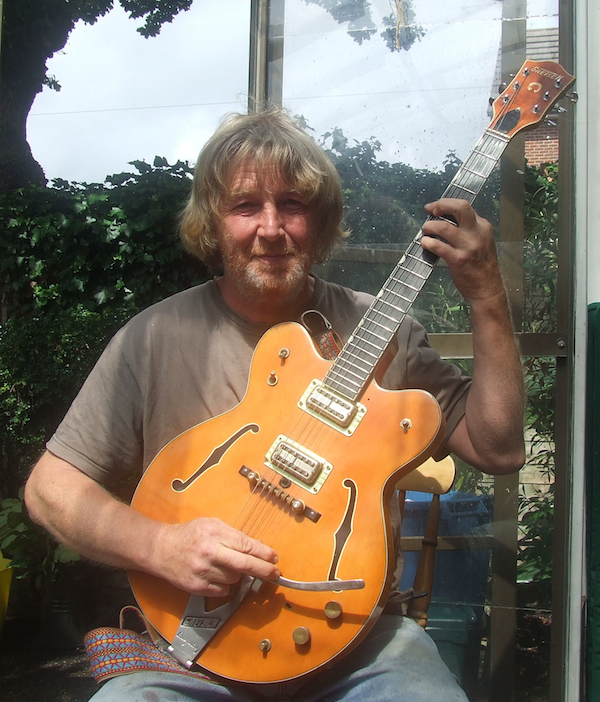 A recent photograph of David Birch, holding the guitar his cousin John Lennon gave him in 1967. “Paperback Writer” would not make it onto “Revolver,” which was released in August of 1966. Instead, “Paperback Writer” was released as a single in June of 1966, jumping almost immediately to No. 1 on the U.S. and U.K. charts. As the band’s latest hit, “Paperback Writer” became a staple of the short, 11-song set played that summer by The Beatles on their last live tour. Tellingly, not a single track from “Revolver” would be performed on that final tour, after which The Beatles concentrated on their studio work, crafting songs that were generally less formulaic. In this light, Lennon’s Gretsch is a relic from an era when The Beatles were still pop stars, before they decided to push their music past the limitations imposed by fame. My first guitar was a ’53 Fender Strat but I started playing Gretsch guitars while learning songs by Chet Atkins. When the Beatles, George Harrison, had a Country Gentleman, I switched to a Chet Atkins 6120. This was in 1963. I was on the road with Johnny and the Hurricanes and recorded using the Gretsch 3120. After retiring, I have seen similar Gretsch and Fender bandmaster amps in several collections of great performers. Lennon, Del Shannon, Chochran and Setzer. Seems to me I started a Gretsch 6120 trend in early rock. I traded my 6120 for a Gibson in the early ’70s and looked for its owner for 20 years. Finally, the owner found me and we’ve been proud to be a part of the 6120 history. “ ” At some point, we decided that somebody on a bike or on foot is not traffic, but an obstruction to traffic.